The Chiefs have delivered the Crusaders their second brutal lesson of the season, winning 26-9 in Christchurch to take top spot in the Super Rugby standings. In a performance just as dominant as the 40-16 triumph when the two powerhouse teams met in Hamilton in round three, the Chiefs lodged a seventh win from nine games to further emphasise their title credentials. They climb a point ahead of the unbeaten Hurricanes, who have two games in hand and face the NSW Waratahs on Saturday. The Crusaders suffered their fifth loss from nine games and look set to drop lower than their current eighth place. Following their loss to the Highlanders in Christchurch last week, the seven-time champions recorded back-to-back home defeats for the first time since 2004. Laden with experienced All Blacks, they couldn't argue with the result, outpointed in every department by a Chiefs side who scored three unanswered tries and led 18-6 at half-time. They did it largely without five-eighth Aaron Cruden, who limped off favouring his left knee in the 19th minute. The Crusaders lost fullback Israel Dagg before kick-off, ruled out with a calf injury, but it is hard to imagine his presence changing the result. 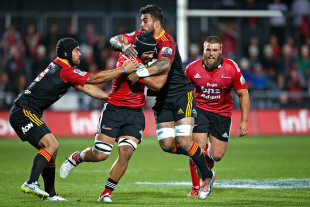 Victory was based around the Chiefs' edge at the set piece and some thunderous defence, which prevented the Crusaders getting over the advantage line or winning quick ball. Coming off a bye, the Chiefs were far brighter on attack, off-loading at will and creating space for dynamic outside backs such as wingers James Lowe and Tim Nanai-Williams. Flanker Sam Cane shaded All Blacks great Richie McCaw in the battle of the opensides, winning a number of telling ruck turnovers. 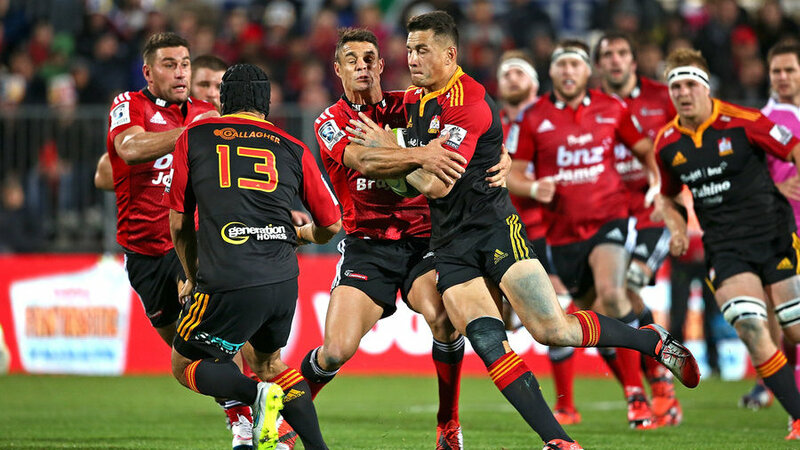 Cane was shown a yellow card for a cynical early offence but the Crusaders couldn't take advantage, with All Blacks playmaker Dan Carter missing three first-half penalty shots before the visitors took control. Michael Leitch crossed in the 21st minute from close range to put his team 13-3 ahead and the industrious No.8 won a turnover after the halftime hooter had sounded to send Lowe on a 75m burst down the blindside in the game's decisive moment. Carter's third penalty was the Crusaders' only second half points before reserve No.8 Liam Squire made the game safe for the Chiefs, scoring from a kick return in which Nanai-Williams and fullback Tom Marshall combined brilliantly.